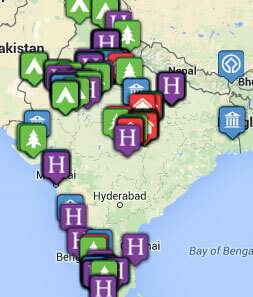 Tribes Overall: "This was our first time in India and we thoroughly enjoyed it. We were unsure about what to expect but soon discovered it is difficult to describe it! All the arrangements were excellent and we were met at each stage of the journey so were never worried about having to fend for ourselves." Tribes Service: "Having discussed our requirements/needs with Paul he put together a great package which addressed those needs. All the information was sent to us via the Vamoos app which was great. When I suggested adding in an extra day Paul was able to suggest where that should be." Guides: "Once again we found all the guides and the driver excellent. They were able to impart all the information we needed in a fast and straightforward way. In each of the three locations we found ourselves understanding the background to the relevant sites. The driver was marvellous at negotiating the traffic in each area." Social & Environmental Responsibility: "This is a difficult question to answer. India is a poor country and you feel so privilged to see it in a very cosseted way. It is not easy to read how the guides and driver really view you although they were all extremely polite and helpful. They work very hard and value their jobs so the tourist industry does benefit them. " Another lovely guesthouse. There was a very nice restaurant opposite where we ate on the last night. The owner was delighful and keen to ensure we enjoyed our stay. Good hotel and what you would expect from this chain. We were upgraded to a suite which was lovely. "Too many to mention! India is quite overwhleming and we are only just starting to think more about what we saw. Having said that seeing the Taj Mahal at sunrise was an extraordinary experience. Difficult to top that!"